A revelation occurred to Stephen Luby, a Stanford epidemiologist while he was 30,000 ft up in the air. Luby was flying over India when he recognized the view from his window seat was actually brick kilns on the ground below. The insight was astonishing for its potential to shed light on an environmental issue that kills thousands of people annually. Luby, a professor of medicine, and a team of Stanford researchers including political scientist Francis Fukuyama and geophysicist Howard Zebker are pursuing Luby’s insight to transform brickmaking in South Asia, an industry that burns biomass, coal, and even tires to dry hand-molded clay into the universal building material. Brick kilns throughout South Asia have a global warming impact that is equivalent to that of all passenger cars in the U.S., and air pollution from these kilns kills several thousand people annually because of respiratory and cardiovascular disease, according to Luby. Beginning in Bangladesh, the novel collaboration is aiming to measure kilns’ health effects and incentivize kiln owners to opt for cleaner technologies. “We’re doing something completely novel here,” Luby said. Before they could deal with kiln owners, the researchers had to work out the number and location of kilns, which are not properly regulated and monitored. That is where Luby’s Jet Airways flight comes in. “I got to thinking: Well, wait a minute, if I can do this sitting in a plane, we must be able by remote satellite to detect (kilns) as well,” Luby said of his aha moment. When Luby’s plane landed, he looked up Stanford satellite data experts. He found Zebker, a professor of electrical engineering and geophysics and an authority on developing space-borne radar systems and using remote sensing data to investigate earthquakes, polar ice movements, volcanoes, and other phenomena. “This being Stanford, I can send him an email, and he says ‘Yeah, sure, let’s have coffee.’” Luby invited Fukuyama, a senior fellow at the Freeman Spogli Institute for International Studies, to help him understand associated governance issues and articulate a politically effective message of change. They plan to put up as a message a public website allowing people to locate information regarding kilns in their area and to learn ways of encouraging kiln owners toward making their work more efficient and cost-effective. Site users will be able to locate kilns that violate regulations on design standards and proximity to communities, among others, and join a larger debate among public and private sector stakeholders. “It won’t just be an outdated report nobody sees,” Luby said. Critical to the proposed website – and the whole initiative – is the Sentinel 1 satellite launched by the European Space Agency in 2015. It offers publicly available images of Earth at a resolution measuring the size of a racquetball court (30 by 30 ft). Equipped with that data and GPS locations of kilns found by ground teams, electrical engineering graduate student Abhilash Sunder Raj built a model that comprehends what kilns looks like from space. Sunder Raj tweaked his algorithm to take into consideration seasonality (kilns do not operate in the rainy season from November to March) and to prevent false positives such as household fires and furnaces. The model was successful as it even found kilns the ground team had overlooked. “We are able to find these needles in a haystack very, very accurately,” Sunder Raj said. They may appear harmless from space, but kilns are outsized dangers on the ground. 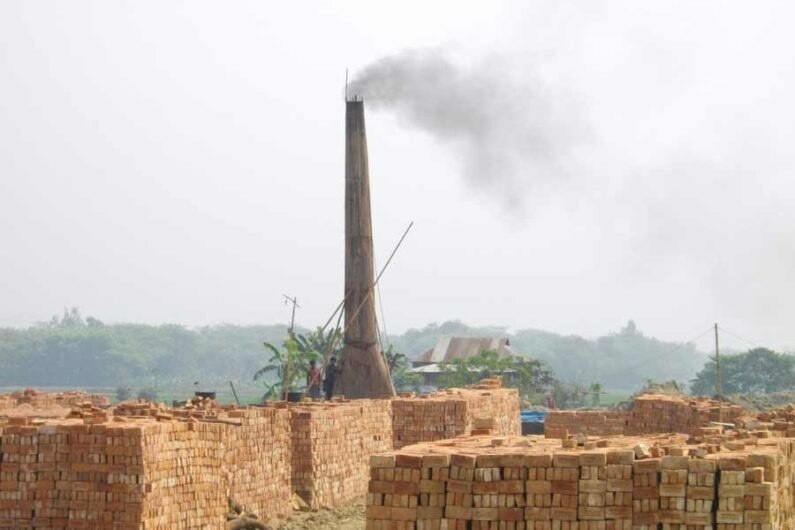 In Bangladesh, a single brick kiln emits up to 48,000 kg of carbon monoxide in a single season. Multiply that by the country’s 8,000 plus kilns, and it is a real catastrophe for health and global warming. Researchers in Bangladesh have found hazardous airborne particulates at average levels over 90 times greater than World Health Organization-suggested levels. The result: numerous people who live downwind from kilns are at higher risk for respiratory and cardiovascular disease. Although the kilns are obviously a health risk, few good data exists regarding the scale of the problem. Alex Yu, a postdoctoral scholar in infectious disease, is aiming to fill in those gaps and learn whether other sources of pollution add to health issues to an extent that even if brick kilns were less polluting, the health problems would continue. He is comparing rates of pneumonia, asthma, and carbon monoxide, among other air-related ailments, in villages with and without kilns. Besides contaminating air, the kilns damage soil around them as laborers dig it up to be made into the clay that will be molded, heated, and dried into bricks. Runoff from stripped patches of land destroys the fertility of adjacent cropland, making it more difficult to grow food and compounding the kilns’ health effects, Yu said. Shifting the brick-making model in Bangladesh and other countries that depend on the polluting kilns will require shifting incentives. Leo Kirby, a graduate student in the International Policy Study program and a research assistant to Fukuyama, is exploring how to most efficiently align the interests of stakeholder groups in Bangladesh and how to identify effective methods to behavior change in a country where the rule of law has narrow reach. It’s a great example of the challenges of changing policy in an environment of weak governance. Existing regulations are imperfectly enforced at best. So, to change behavior, you have to change the incentive structures. Kirby’s interviews with brick kiln owners, global NGOs, and numeorus environmental and community organizations will serve as the foundation for a case study for a policy reform training program Fukuyama runs for mid-career public officials in developing countries. Nina Brooks, a doctoral candidate in the Emmett Interdisciplinary Program in Environment and Resources, will talk with kiln owners to better comprehend what limits decisions to adopt better efficiency. The Stanford team is partnering with Greentech Knowledge Solutions, a Delhi-based leader in enhancing brick kiln efficiency. Luby is looking towards the climate community to help support the revolution of the brick kiln sector in Bangladesh and, eventually, across South Asia. The improvements in efficiency will pay for themselves, but stakeholders will need support to accomplish this more advantageous equilibrium. Luby is also a senior fellow in the Stanford Woods Institute for the Environment and the Freeman Spogli Institute for International Studies, and director of research at the Center for Innovation in Global Health. Fukuyama is also the Olivier Nomellini Senior Fellow and Mosbacher Director at the Center on Democracy, Development and the Rule of Law in the Freeman Spogli Institute. The study is supported by the Stanford Woods Institute’s Environmental Venture Projects program and the Stanford Food Allergy Center Fund. Stephen Luby describes how Stanford researchers are working to revolutionize brick-making in Southeast Asia.